Congrats on a nice score of antique planes. Oh, and if you would like for me to ensure those Leamy planes are adjusted right just send them to North Alabama, heck you can even send them C.O.D. & I'll pay the postage. Oh I feel for Nancy. All weekend long "Who wants to be me?!?!" 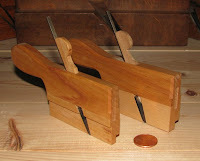 I'm happy for both of us - you, for getting a group of serious hand planes and me, because I know your gonna' write and take pictures so you can teach me how to use them. Cheeky little bugger, aren't I? Nice! Both the vintage and the new planes are sweet! What a good day indeed - and many more to come using them!